A (just slightly late) Merry Christmas to everyone! Christmas time is usually the time for family traditions, visiting relatives and eating lots and lots of food. Oh yes, and presents. Not so much for us this year, as we only made it to 1 out of 4. And, no, it wasn’t the presents. 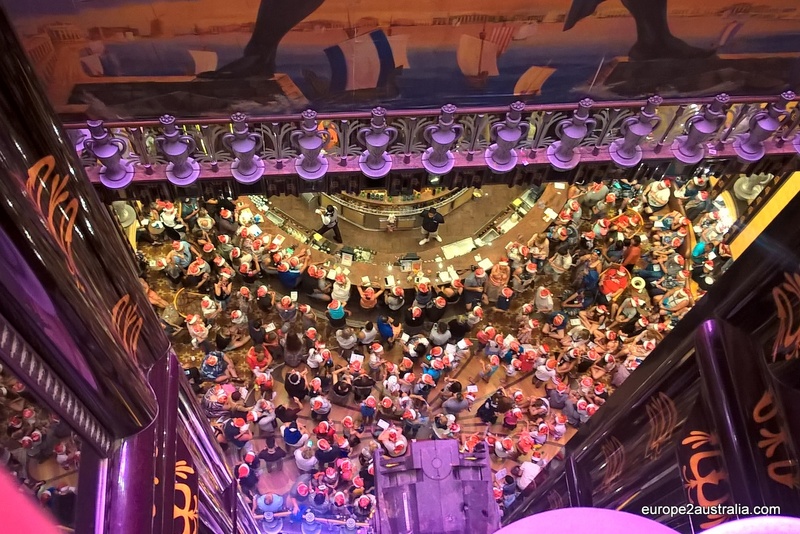 Christmas on a cruise is a bit different than “normal” Christmas. For one, there is a lot less build up. There was hardly any decoration on the boat (except on a few cabin doors belonging to families with children), and the days before we taken up mostly of sun-bathing and snorkeling. 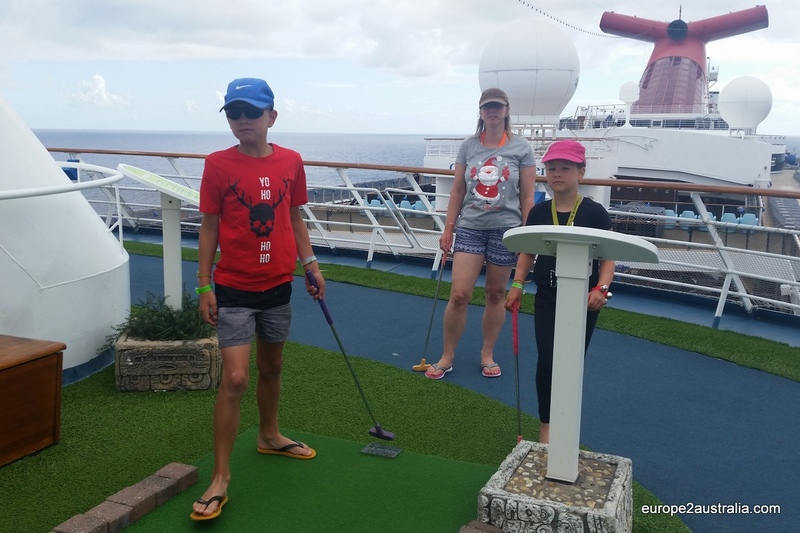 Starting Christmas day with a round of mini golf is typically not what you’d expect. 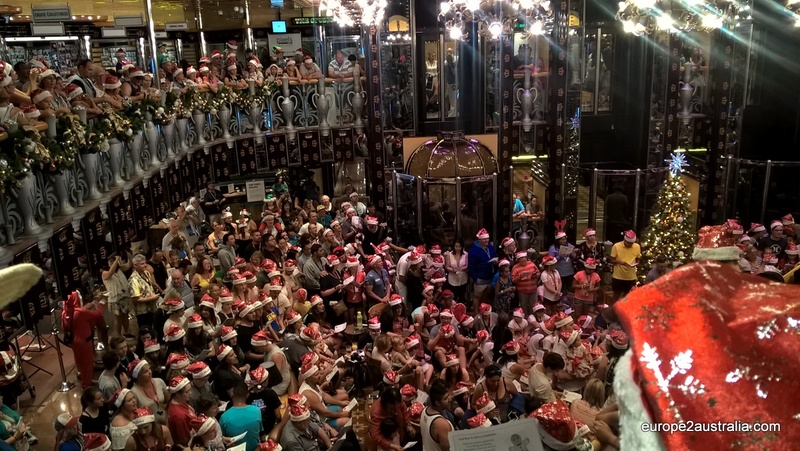 However, on the 24th things got more Christmas-y with a half hour of singing Christmas carols in the central lounge on deck 2. It seemed that most passengers showed up and tried crowding into the small space. The Christmas hats were all gone in no time. 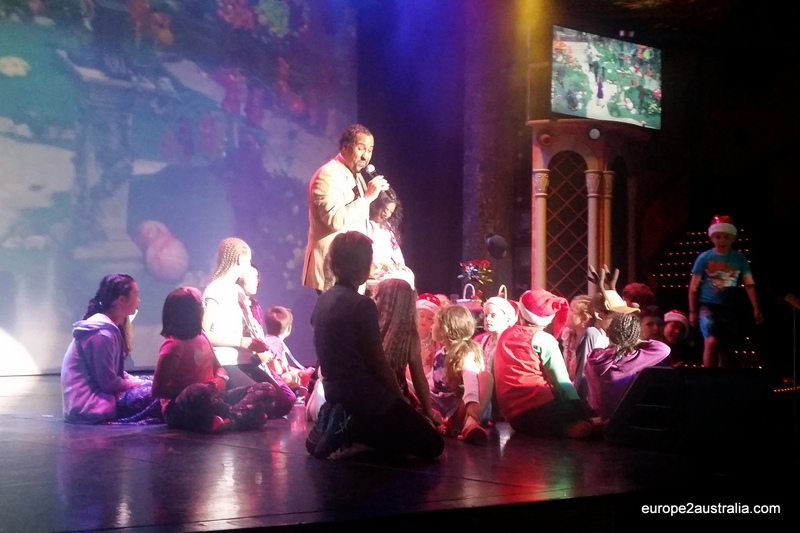 This was followed by a Christmas special show in the afternoon, with a lot more carols and children participation. 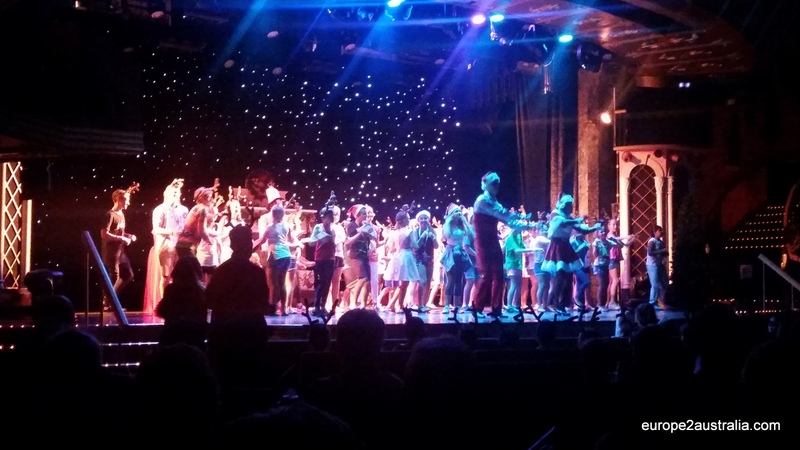 Singing and dancing on stage, with the help of some of the performers from the evening shows. The evening show also had a bit of Christmas special, even though it was only for one song. 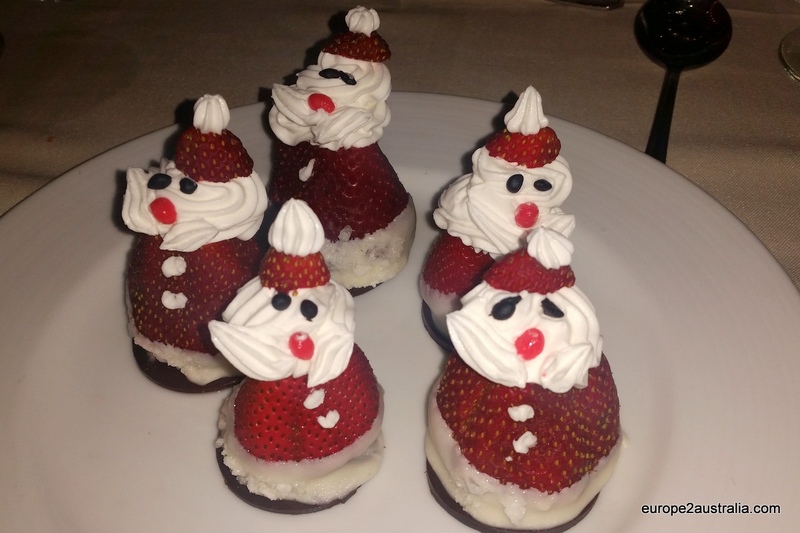 On Christmas day (the 25th), we got down to the above mentioned food, with an extensive Christmas lunch, including turkey and strawberry Santa’s. They were almost too cute to eat. 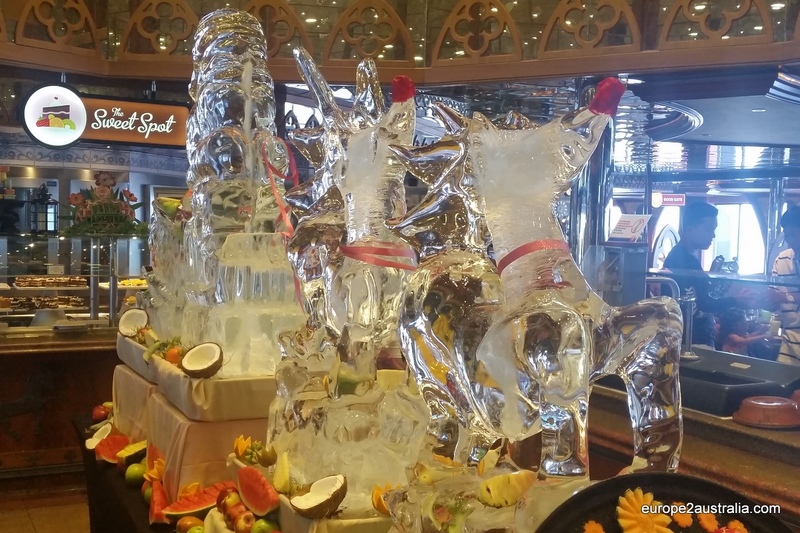 And, since we were on a cruise, the stereotypical ice sculpture was in the shape of a sleigh (although filled with tropical fruit instead of presents). The only ice we saw all Christmas this year. All in all a bit of a bizarre experience, truth be told, as it didn’t really feel like Christmas at all. But then, last year didn’t really feel like that, either, spending Christmas eve on the beach. I guess I am too European and miss the cold weather and Glühwein. Echt koud is het hier ook niet geweest! Het kwik kwam niet lager dan een graad of 8. Korte dagen met veel donker dat wel. Fijne vakantie en alle goeds voor het nieuwe jaar! Groetjes van de van Meursjes. I do miss the Glühwein too… the cold weather… not so sure about that one. I guess I’d take white Christmas and then straight back to summer. It’s more about the days being long here and therefor the lights and candles do not do as much as they did when I still lived in Switzerland.